Wednesday was a fine, fine day. We must be in some sort of spring heat wave here in the Mid-Atlantic as it hit 80 F again. I bailed on the Wednesday group ride (thanks to Jay for taking over the lead) and rocked out solo so I could make time and pack as much trail in as possible. I was on a time line, Sleater-Kinney was playing and I had tix. The trails were in top shape for the most part, the reroute of the spring Jay and I did on Sat. really helped things out. The spring was still flowing heartily, but the trail was drying. Some of the trails I hit were so dry and dusty that things got sketchy in the high speed corners. I like to rail through the turns, but conditions are different than they were just a short time ago and I laid the bike down once as the front washed out. It's good, keeps you on your toes and doesn't let you get comfortable. Every ride the trail changes a bit and the conditions are a little different. Early show, the Thermals open, short, fast, high energy songs. I dig it, glad I made it out to see them. 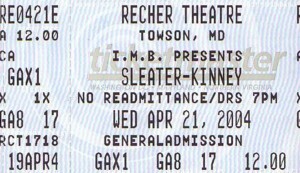 Sleater-Kinney plays an hour long set plus an encore of 4 or 5 songs including a nice Bikini Kill cover of "Rebel Girl". They rock out full of passion and geniune love for the music and the audience. Can't wait for the new album. In the meantime, if you aren't already down with them, go buy a CD and support the bands that don't have the big money machine promoting them. 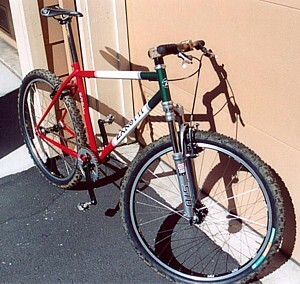 Stolen SS Alert: All right outlaws, keep your eyes peeled for this stolen single speed hotrod with the Italian paint job. It was stolen in the San Francisco Bay area and belongs to the owner of Zanotti Cycles. It's a one of a kind custom rig and should be easy to spot. The bike was due to be sent to SSO HQ for testing before some scumbag decided to make it theirs. If you spot it or it's offered up for sale contact Zanotti Cycles or email us here. Ka-ching! That's the sound of a deposit going in the karma bank. This weekend was time to give back to the trails. With all of the rain earlier in the week I wasn't expecting things to be dry enough for trail riding on Saturday. Setting off on my road ride I was cutting through the park roads when I decided to nose into one of the trails that serves as a good barometer for the rest of the park. Hmmm, dry dirt. I continue on. Things are looking good. I decide to head back for the MTB and hit the trails. On the way out, on one of the main access trails, a new spring has popped out of a hillside and is now feeding the trail. 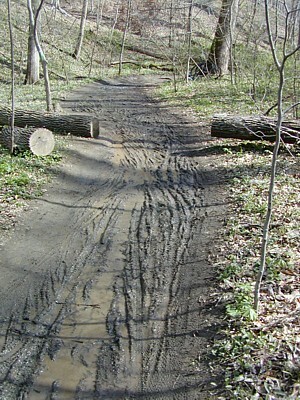 Wow, I've never seen this happen in 10+ years riding this trail. The water flow is wreaking havoc on a looooong section of trail. When I get home I ring up Jay who's game for a ride/maintenance session. I grab some tools and we meet at the trailhead. Some quick work and we have a drainage ditch dug diverting the new spring off the trail and into a large grassy area. A bit of stonework reinforces things and we are ready to move on. We hit up a couple more spots on the ride, armoring a large, low muddy area with rocks and doing another water diversion to get the liquid off the trail. By the time we get back to our first work area we can already see the mud starting to get tacky on the edges. It's going to take a few days to completely dry out, but it's over 80 F today and it's forecast to be like that for the next few days, so this should help a lot. Sunday is an official MORE work day and we wind up with a sizable crew to reroute a muddy run-off area that doubles as the trail. The new trail goes through the trees, twists and turns and is much more sustainable, all done in a few hours. Not only is it better designed for water run-off, it's more fun to ride. Double bonus. A few of us rode before the work day, some more of us rode afterwards and anyone who got out on the trail Sunday was sure to have a fine day as most stuff was hard and fast. The good stuff was prime, but the bad areas were still pretty rough, which just reinforces the need to stay off the trails for 24 - 48 hours after we get the wet stuff. It felt like summer with the sweat pumping out of the pores on the climbs and the sun beating down. Of course, thanks goes out to all of the volunteers who showed up and sweated, this kind of stuff scores big points with the park and keeps our trails in prime riding shape.